The depth of flavour that is a hallmark of European cooking comes from cooking simple ingredients in ways that bring out their richness and flavour. Techniques like making a roux, and browning meat are simple, but doing it correctly makes all the difference between a good dish, and an indifferent one. 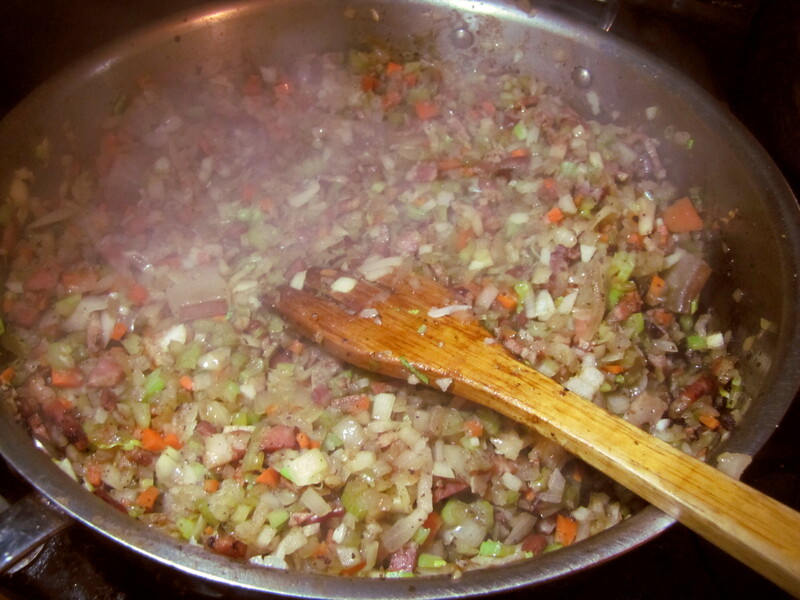 One of the most basic processes for making French, Italian, or Spanish food, is to begin with a soffritto (or mirepoix, or refogado, or battuto). It’s a critical component of sauce espagnole, ragu, stock, or osso bucco. The basic recipe is simply onion, carrot, and celery at a ratio of 2:1:1. Finely chop the vegetables, and cook them in fat of some kind (whether butter, olive oil, or animal fat.) The richness of the flavour comes when the water has all boiled off, and the vegetables begin to turn golden. At this point, recipes will diverge. You can add garlic, or tomato, or wine, or other spices. You might cook it longer, until it’s mushy and brown, or take it off the heat. The critical thing is to get it to this point, before you start bunging other wet ingredients in. 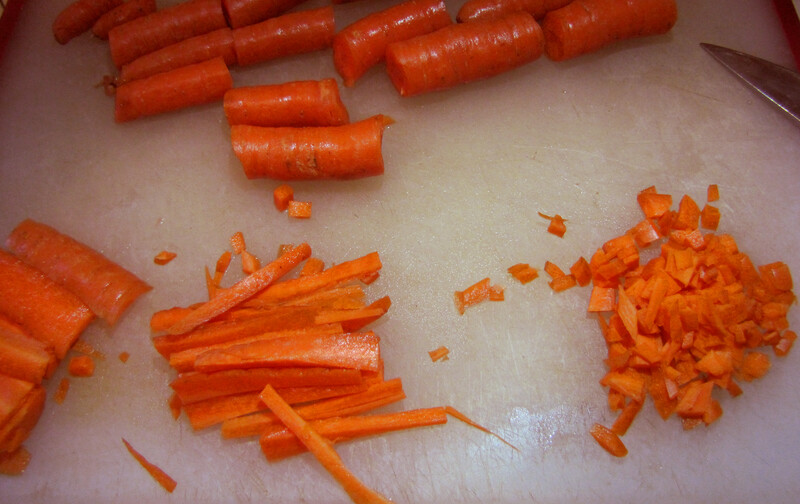 Chop the vegetables into small (~1/4 inch, 5mm), relatively uniform, pieces. If you are using bacon, cut the bacon into similar sized pieces (it will shrink, so you can cut it slightly larger). Place the butter, fat, oil or bacon into a pan. Heat it over medium, until the oil is hot, or the bacon is well cooked (and has released most of its fat). Add the vegetables and cook, stirring occasionally. As the the mixture heats up, the vegetables will release quite a lot of water. Stir occasionally, so they don’t stick to the pan. You can add the bay leaves at this point. When the water evaporates, the onions should be turning transparent, and the carrots will likely be just starting to turn soft. Turn the heat down to medium-low, if you’re not in a hurry. Otherwise, keep a close eye on the pan so nothing sticks and burns. Stir a little more frequently now. If things start sticking and browning on the bottom of the pan, just deglase — add a little bit of water, or white wine, or stock, and the brown bits will come right off. These brown bits contain most of the rich umami flavour that we are trying to achieve! Once the onions have taken on a litte bit of a golden colour, you can add the pepper, the chili, or garlic. I normally wouldn’t add the pepper or chili at the beginning, because it can sometimes absorb enough oil to be a problem, and it might also burn. Make sure there’s enough oil still sloshing around to coat the garlic, so it gets nice and brown. At this point, once the onions have started to brown, and the carrot is soft, it’s pretty much done. Taste it — it should be sweet and rich. Depending on your recipe, you’ll either keep cooking it, until it’s quite dark. Or you will start using it pretty much right away.